When it comes to wonderfully lost afternoons with coffee and cake, there is no better place for us than Vienna with its inimitable coffee house culture. 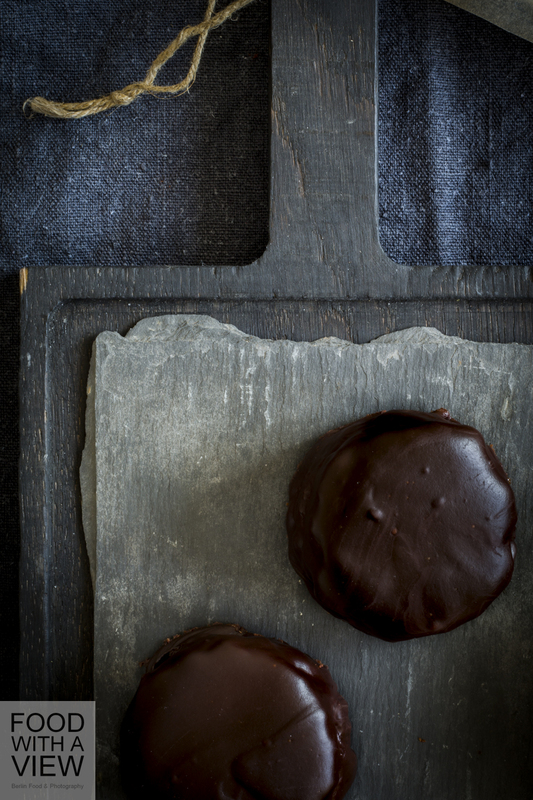 So today, in memory of beautiful visits far too long ago, we come along with most chocolaty little cakes with a big and well known name: Sachertorte. Invented by Franz Schubert in Vienna in 1832 and perfected by his son Eduard some time later, it is almost the mother of all chocolate cakes and a queen of any cake display. Event though its name indicates a torte, it is rather a cake since there’s no whipped cream layer or anything alike involved. But far from being just another chocolate cake, it is a master piece composed of so called Sacher sponge cake, apricot jam layers and a rich chocolate coating. No marcipan layer, never ever, but maybe a little rum or cognac and also – that’s how we prefer it – some nuts involved. Once you fall for this cake, it will never let you go with its unresistable combination of fruity sweetness and wonderfully bitter flavors. In the past few years, we only faced one problem when it came to having an afternoon out at the café: you don’t exactly find a vegan hack at any given corner. Or, to be exact, you find it at no corner at all (at least not at corners that we know about). You know how things end in cases like these: do it yourself, right? So, since we were quite successful last year with some sponge cake experiments without eggs or butter (and since Christmas sugar shock is far away enough in the meantime), we gave it a try. We decided for little cakes instead of a big one, and a first attempt had been promising. A second made us happy – and also some dear friends. So here we are. With cake but without decoration, sorry. When it comes to handwriting with an icing tip filled with melted chocolate, we are for sure not the most talented people in the world. But if you are good at these kind of things, take a chance, shape a circle on each little cake and write Sacher or just an S inside – that’s what the traditional ornament would be like. Be that as it may: Seems we have a new favourite cake, abd we’re happy to share the recipe with you. In addition to melted couverture, a conventional sacher sponge – like sponge batter in general – is based on quite an amount of beaten egg white and melted butter. As an alternative for the latter, we prefer cocoa butter over margarine and add a little plant-based milk to compensate its firmer texture. Admittedly it is pricier, but you need only very little of it. Baking powder and sparkling water add volume to the cake. The batter is more compact than usual but will be fine in the end. In summer time when apricots are in season, some homemade apricot jam will even enhacne the cake’s taste (find a recipe for fruit jam here, it works with most fruits, including apricots). This is also a wonderful opportunity to make use of still edible but mashy fruits – a state that apricots get so easily in when they are fully ripened, don’t they. Just make jam instead of throwing them away 😉 . Stored in the fridge, the little cakes will stay fresh for a couple of days. You can also store them in the deep-freezer for a while. For the Sacher sponge batter, gently roast the hazelnuts in an ungreased pan at medium temperature while frequently stirring. Do so until the nuts smell nicely and the skins start to crack. Remove the nuts from the pan, leave to cool a little and then scrub the nuts in order to remove the skins, using a clean kitchen towel. Let the nuts cool down completely, then grind them rather finely in a food chopper. Work at intervals to avoid a sticky texture. We prefer a not too fine texture, but if you do, sift the ground nuts after processing and re-grind anything left in the sieve until all pieces are finely ground. In a small saucepan, carefully melt couverture, oil, and almond milk at low temperature and thoroughly whisk until everything is smooth and well combined. Leave to cool a little. Preheat the oven (160 °C) and line a baking plate with baking paper. Combine both flours, cocoa powder, baking powder, and the spices. In another saucepan, carefully melt the cocoa butter at low temperature and put aside. Sift the icing sugar on top of the melted chocolate and fold in carefully with a whisk. In three steps, sift the flour mixture on top and fold in rather loosely and quickly with a wooden spoon (don’t stir too much and/or too long, otherwise the batter will become too firm). Do the same with the ground hazelnuts, then quickly fold in the cocoa butter and finally the sparkling water. Place the mixture on the baking tray and with a palette knife, evenly spread out the batter and shape a rectangle with about 30 x 35 cm. Bake in the oven for 10-12 minutes until the top is no longer moist and a little wooden pick stuck in the middle of the cake comes out again with no dough sticking on it. Remove the sponge cake from the oven and use the baking paper to pull it onto a cold baking tray. Place a fresh baking sheet on the cake, place a cooling rack on top and turn the whole thing over. Remove the used baking paper from the cake (that is now on top) and allow the cake to cool down completely. Cut out 18 mall pastry cases using the cookie cutter or the jar (you can make use of the remains to prepare layer desserts or rum truffles if you like). If you like, moisten each pastry case with a little cognac. For the apricot jam layer, boil up the jam and the water in a saucepan and whisk until smooth. Take the pan off the stove; don’t turn off the stove and keep it at the lowest temperature for later use. Pour the hot jam mixture into a jug ​​and finely blend with a hand-held blender. Return to the saucepan. For further use, the apricot jam should not be very hot, but still clearly warm and runny. As soon as it cools down too much during the further processing and becomes thick again, briefly place it on the stove and reheat it. The reason for the need of tempering is the following: If the jam is too hot, it will be completely absorbed by the cake dough. If it cools down too much and becomes thick again, it would just lie on top of the cake without bonding and would be pulled down by the liquid couverture in the next step. – Cover each pastry case with 1-2 tbsp. of apricot jam and spread evenly. Then place three pastry cases on top of each other in order to get 6 little cakes with 3 layers each. Generously cover the sides with jam as well. Put the cakes in the refrigerator and allow the coating to dry for 30 minutes. 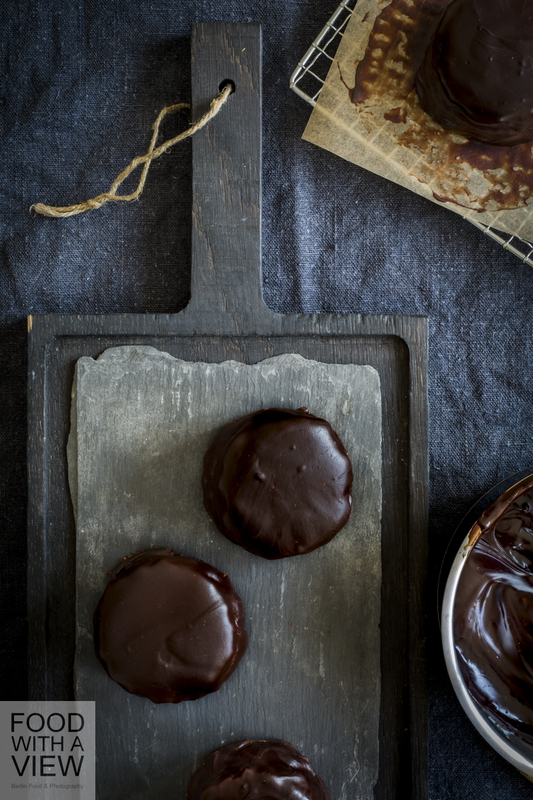 For the chocolate coating, heat up sugar and water in a sauce pan until the sugar dissolves. Add the couverture chocolate and carefully melt at gentle heat. Thoroughly whisk until well combined. The chocolate shall not get too hot or cook in this process. Remove the little cakes from the refrigerator and place on a drip-off rack. Now spread each cake with enough couverture that it runs down the sides. Use a pallet knife to level the surface and to spread more couverture on still uncoated parts of the cake’s sides. 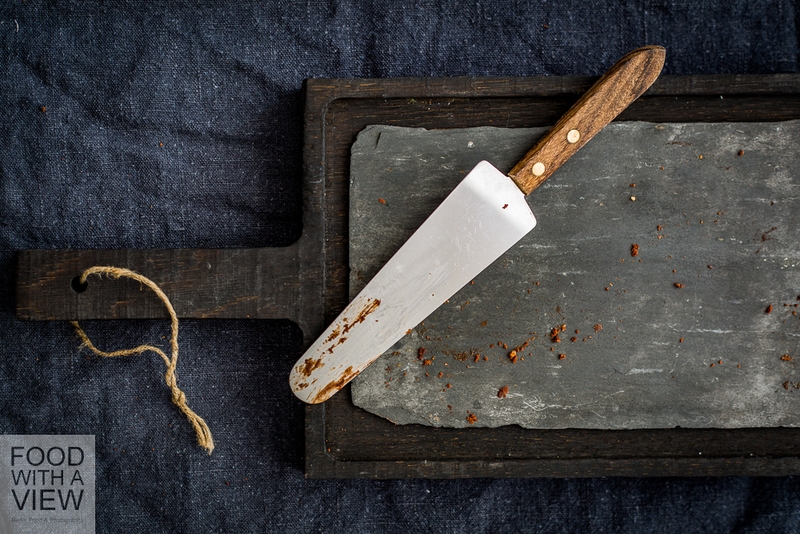 Line a flat plate with baking paper, and once any excess couverture has dripped off, gently take the cakes off the rack with the pallet knife and place on the prepared plate. Leave to set for at least 3 hours or overnight (the coating stays slightly creamy, so it is not as firm as fully set pure chocolate). Place the plate with the cakes in the fridge for 1 hour, then you will easily be able to detach them from the baking paper. Put aside again at room temperature for 30 minutes and serve with whipped cream or just like this. The cakes taste the best if you let them rest for let’s say 1-2 days. By then, all components are well combined and the taste is just great. Ach Wien, wie bist Du schön. Wenn es um wunderbar vertrödelte Nachmittage bei Kaffee & Kuchen geht, gibt es für uns keinen besseren Ort als die Donau-Metropole mit ihrer unnachahmlichen Kaffeehauskultur. 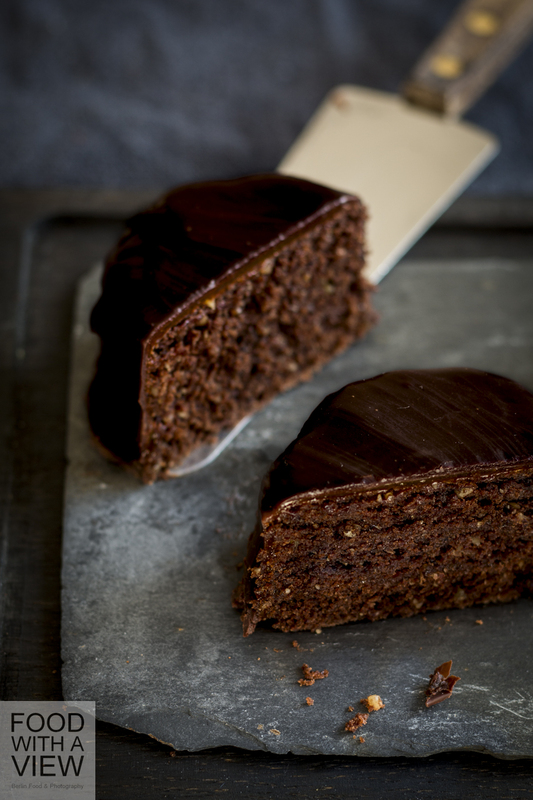 Deshalb gibt es bei uns heute in Erinnerung an schöne und inzwischen schon viel zu lang zurückliegende Besuche ebenso schokosatte wie marillenseelige Törtchen mit berufenem Namen: Sachertorte ist quasi die Mutter aller Schokoladengebäcke und Königin der Kuchenvitrinen. Erfunden wurde sie der Überlieferung nach 1832 in Wien von Franz Sacher und perfektioniert von dessen Sohn Eduard. Genau genommen ist die Torte ein Kuchen, jedenfalls wenn man mit ersterer eher Schlagsahne und Cremes assoziiert, die beide darin nicht vorkommen. Ein ganz normaler Schokoladenkuchen ist sie jedoch auch nicht, sondern, wenn beste Zutaten verwendet werden, ein Traum aus einem der Wiener Masse ähnlichen saftig-lockeren Teig, süßer Marillenkonfitüre und einem dunklen Schokoladenüberzug mit hohem Kakaogehalt. Und sonst nix, auch kein Marzipanüberzug, wie er in vielen Konditoreien nördlich der Alpen an der Sacher-Tagesordnung ist. Gelegentlich aber gelangt etwas Rum oder Cognac und für uns gern auch gemahlene Nüssen oder Mandeln in den Teig, bekannt auch als Nuss-Sacher. Ist man so wie wir der unwiderstehlichen Verbindung von süßer Aprikose und bitter-aromatischer Schokolade einmal verfallen, kommt man nicht mehr davon los. Es gab da in den zurückliegenden Jahren nur ein Problem für unser gemeinsames vegan-vegetarisch Kuchen-Ausgehvergnügen: als vegan hack ist sie – jedenfalls in Berlin – nicht gerade an jeder Ecke zu haben. Also, genau genommen an keiner Ecke, jedenfalls an keiner uns bekannten. Dies galt es zu ändern, zumindest für die heimische Kaffeetafel. Da wir seit dem vergangenen Sommer diverse Experimente mit Biskuit und Wiener Masse ohne Ei und Butter gut gelungen fanden und auch der weihnachtliche Zuckerschock so langsam überwunden ist, sollte es daher kürzlich endlich soweit sein. Wir entschieden uns für kleine Törtchen statt einer großen Torte, und ein erster Anlauf ließ hoffen. Der zweite überzeugte schließlich uns und auch damit beschenkte Freunde – für uns stets ein Lackmustest. Vor lauter Freude über die wiedergewonnene Torte wurde nur die Deko nicht mitbedacht. Aber vielleicht ist das auch besser so: Eine rundum schöne Handschrift haben wir mit einer mit Schokolade gefüllten Dekospritze in der Hand nicht wirklich. Wer aber ein Händchen dafür hat und die traditionelle Optik vorzieht, schreibt noch “Sacher” auf die Glasur oder malt auf jedes Törtchen einen Kreis und schreibt schwungvoll ein S hinein. Und nun freuen wir uns, das Rezept für unseren neuen Lieblingskuchen mit euch zu teilen. Neben geschmolzener Kuvertüre lebt eine herkömmliche Sachermasse – genau wie Biskuit und Wiener Masse – von einem gerüttelt Maß an steif geschlagenem Eiweiß und geschmolzener Butter. Wer wie wir für letztere ungern Margarine als Alternative verwendet, greift zu Kakaobutter, und etwas pflanzliche Milch in der Grundmasse gleicht deren im Vergleich festere Konsistenz aus. Sie ist zugegebenermaßen nicht ganz kostengünstig, aber man braucht nur sehr wenig davon. Für Volumen wiederum sorgen Weinstein-Backpulver und Kohlensäure. Fertig angerührt ist die Masse kompakter als gewohnt, geht aber beim Backen noch auf. Übrigens: Solltet ihr diese Torte in der Sommerzeit backen (denn sie schmeckt wirklich immer…), kann man die Marmelade aus saisonalen Früchten auch selbst machen (hier ein Rezepept für Mirabellen-Marmelade, die aber auch für andere Früchte funktioniert). Das macht nicht nur die Torte noch einmal köstlicher, sondern es ist auch eine gute Möglichkeit, angeditschte und schon sehr weich Aprikosen zu verwenden. Also nicht wegwerfen, wenn die kleinen Matschmonster, in die reife Aprikosen sich ja gern verwandeln, noch essbar sind. Die Törtchen halten sich im Kühlschrank ein paar Tage und können auch eingefroren werden. Für die Sachermasse die Haselnusskerne in einer trockenen Pfanne bei mittlerer Temperatur unter häufigem Wenden rösten, bis die Nüsse duften und die Häutchen rissig werden. Die Nusskerne herausnehmen, etwas abkühlen lassen und danach in einem sauberen Küchenhandtuch die Häutchen abreiben. Die Nüsse ganz abkühlen lassen, dann in einem Blitzhacker fein mahlen. In Intervallen arbeiten, damit das Nussöl dabei nicht austritt. Wir mögen es gern, wenn noch ein paar kleine Stückchen zu sehen (und zu schmecken sind). Wer das nicht möchte, siebt nach jedem Mahldurchgang die Nüsse durch ein nicht zu feines Sieb und mahl die im Sieb verbleibenden Stückchen nochmals, bis alles fein vermahlen ist. In einem kleinen Topf die Kuvertüre mit dem Öl und der Mandelmilch bei niedriger Temperatur schmelzen und mit dem Schneebesen gründlich durchrühren, bis alles emulgiert ist. Etwas abkühlen lassen. und den Gewürzen mischen. Die Kakaobutter in einem Topf bei niedrigster Hitze vorsichtig schmelzen und beiseitestellen. Den Puderzucker über die Schokoladencreme sieben und mit einem Schneebesen gründlich unterziehen. Dann in 3 Schritten die Mehlmischung über die Creme sieben und mit einem Holzlöffel locker und zügig unterheben. Schließlich die gemahlenen Nüsse, danach die Kakaobutter und zuletzt das Mineralwasser zugeben und ebenfalls mit dem Holzlöffel unterziehen. Die Masse auf das Backblech geben und mit einem Palettmesser gleichmäßig zu einem etwa 30 x 35 cm großen Rechteck ausstreichen. In den Ofen schieben und 10-12 Minuten backen, bis die Oberseite nicht mehr feucht ist und an einem in die Mitte gesteckten Holzstäbchen kein Teig kleben bleibt. Den fertig gebackenen Teig aus dem Ofen nehmen und mit dem Backpapier auf ein kaltes weiteres Backblech ziehen. Ein frisches Backpapier auf den Kuchen legen, darauf ein Auskühlgitter legen und das Ganze mit Schwung umdrehen. Das nun obenauf liegende benutzte Backpapier vom Kuchen abziehen und die Teigplatte auf dem Gitter abkühlen lassen. Mit einem runden Ausstecher oder einem dünnwandigen Glas 18 Törtchenböden ausstechen (die Teigreste eignen sich grob zerbröselt gut für Schichtdesserts oder als Grundlage für Rumkugeln). Gegebenenfalls alle Böden mit etwas Cognac benetzen. Für den Schokoladenguss in einem Topf den Zucker im Wasser erhitzen und auflösen. Die Schokolade vorsichtig darin schmelzen und alles mit einem Schneebesen gut durchrühren. Die Törtchen aus dem Kühlschrank nehmen und auf ein Abtropfgitter setzen. Jedes Törtchen mit so viel Kuvertüre übergießen, dass diese an den Seiten herunterläuft. Mit einem Palettmesser jeweils die Oberfläche etwas glätten. Noch nicht bedeckte Stellen an den Seiten mit Hilfe des Palettmesser ebenfalls mit Kuvertüre bestreichen. Einen flachen Teller mit Butterbrot- oder Backpapier auslegen. Wenn die überflüssige Schokolade abgetropft und der Überzug noch nicht fest geworden ist, die Törtchen mit dem Palettmesser vorsichtig vom Gitter lösen und auf den vorbereiteten Teller setzen. Den Guss für mindesten 3 Stunden oder über Nacht fest werden lassen (er bleibt ganz leicht cremig, wird also nicht so fest wie Schokolade pur). Dann den Teller für 1 Stunde in den Kühlschrank stellen, die Törtchen lassen sich dann mit einem Palettmesser ganz leicht vom Papier lösen. Vor dem Servieren für 30 Minuten bei Raumtemperatur stehen lassen und nach Belieben mit Schlagsahne oder ohne servieren. Am besten sind die Törtchen übrigens nach 1-2 Tagen. Dann haben sich alle Komponenten zu einem besonders aromatischen Gesamtwerk verbunden. 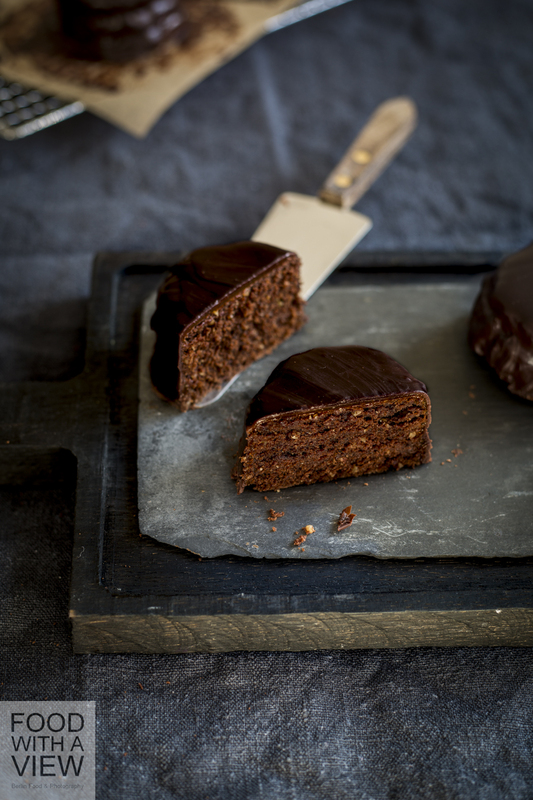 Vegan Sachertorte – almost a sacrilege would it not look so fantastic. One to try even if not a vegan. Thanks a lot for the lovely compliment :-). I could imagine you would like it – our friends didn’t even notice it’s vegan ;-). Herzlichen Dank, Britta! Das freut uns sehr, dass Du’s ausprobieren willst, ganz viel Vergnügen mit den Törtchen und liebe Grüße zurück :-). Looks amazing!! I think I have finally found name of the cake I was longing for since my childhood… thank you!!! Thanks a lot for our lovely comment, Margot, you’re welcome :-). Vielen Dank Dir, und viel Spaß mit dem Rezept! Wow!!! !I love Sache,beautiful and delicius cake!very compliments! Many thanks for your lovely comment, Melissa, so great that you like the cake :-). Vegane Sachertörtchen, wie wunderbar 🙂 Die werde ich probieren müssen. Ich habe grade euer Buch verschlungen und bin ganz fasziniert von der Detailliebe, der Hingabe zum Essen und den ausgesucht guten Zutaten in euren Rezepten. Ich besitze wirklich eine MENGE Kochbücher, die ich alle nur aufgrund ihrer Schönheit, ihres Stils und ihrer “Message” dahinter kaufe, aber eures ist eines der Schönsten. Wundervoll! Vielen dank für soviel Inspiration. Liebe Stephanie, wow -habe ganz vielen Dank für so ein schönes Kompliment! Das bedeutet uns viel, und wir wünschen Dir noch viel Vergnügen mit unserem Buch. – Und wie schön, dass Dir auch diese Sachertörtchen gefallen. Viel Spaß beim Nachbacken, wir hoffen, sie schmecken Dir :-). Viele liebe Grüße von uns zurück! Ich bin mir sicher, dass sie grandios schmecken!